Peanut Snake: Celebrate The Mooz! Lovely artwork by Tim Smart. My friend Martin, aka PowderedCows, has put together an amazing album, entitled Moozikk, that will be available to download from this Saturday, April 9th, from here, with limited CD copies available from the launch gig at Champions in Bournemouth (and possibly directly from the man himself?). 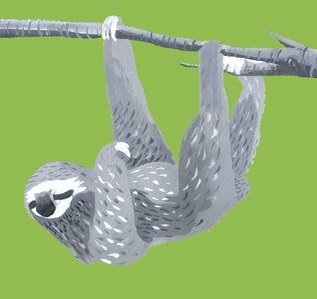 All proceeds are going to help The Tree Foundation and their work to help the critically endangered three-toed sloth. Musicians were invited to contribute basic tracks (a vocal plus one instrument) which were then put through the Powdered Cow's magical mystical blender. I've contributed the Hardsparrow song Ghost Castle, a much better re-recorded version of a tune from my Half-Bakes album. He has made it sound well spooky. There's also a ton of stuff by loads of great Dorset musicians, including Expedition Guide (Lee Jones of Dutch Husband/Head of a Cuban Trojan), and the ladies' fave, Michael Wookey. Please check out and join the Facebook group here. And check out the Tree Foundation's homepage here. Here's Expedition Guide's tune, click the link to hear more on the PowderedCows Soundcloud. Here's the full track listing..